This is Bill Reed's moving story of how as a young man he found himself, along with thousands of his comrades, in the nightmare of Japanese captivity. Before long he was a slave labourer on the notorious Burma Railway, living under the most atrocious conditions and subject to barbarous treatment by his captors. Unlike so many ( it is said that one Commonwealth POW died for every sleeper laid) Bill somehow managed to survive to tell the tale. Indeed it is remarkable that this story has not been told before, so graphic are Bill's memories of the hardships and horrors. 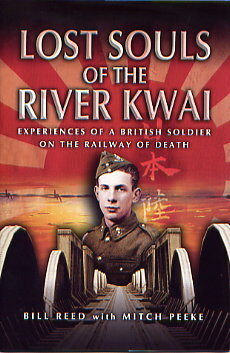 New first-hand accounts by survivors of the Railway of Death are now very rare and, by any standards, Lost Souls of the River Kwai is an important addition to the bibliography of the subject. It is an added bonus that the book goes on to describe how Bill's experiences as a prisoner of war have affected his life since. This is a moving and well-written account of war at its darkest and the strength of the human spirit at its strongest.